Below is a sample PPL Electric Bill. When you choose a lower electric rate at new.electricrate.com, the rate you choose will replace the PPL price to compare rate which includes the Transmission Charge (Number 4) and the Generation Charge (Number 6). All other charges on the PPL bill remain the same. Most PPL residential customers receive electric services under the same rate class and some have special rates. This is also true for commercial and industrial customers. The price for delivering electricity to your home or business. The monthly charge to cover PPL Electric Utilities’ basic costs for billing, metering and meter reading. The cost of moving electricity from a generating plant to the PPL distribution system. When you select an electric generation supplier, that supplier, not PPL, will bill you for transmission charges. A charge on every customer’s bill to cover an electric utility’s transition or stranded costs, as allowed by the Public Utility Commission. These costs are not new; they have always been part of your bill. The amount your electric generation supplier charges for making your electricity. 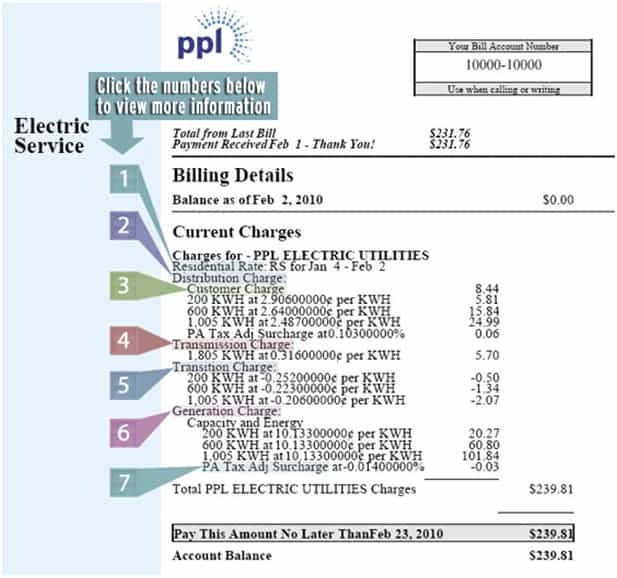 A surcharge on your total distribution charges from PPL Electric Utilities, which reflects changes in various state taxes already included in your bill. This surcharge may change periodically.